The human appetite for fish has caused a great deal of trouble for the well-being of the world’s oceans. A single animal on your dinner plate can translate into hundreds of pounds of “by-catch” – organisms thrown back after being hauled up by nets, lines, and trawls. 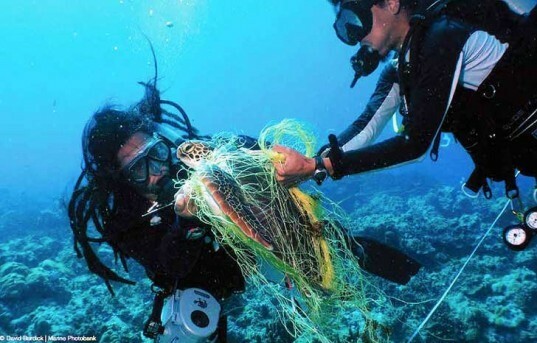 According to a new report released by Oceana, every year 2 billion pounds of sea life captured by US fisheries is damaged or killed and thrown right back into the sea. 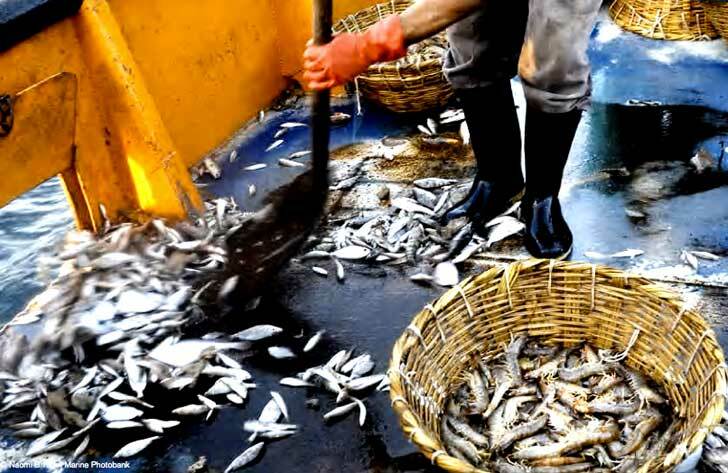 Their detailed research exposes the nine worst by-catch fisheries around the country, and which harvesting methods are the most harmful to the environment. In all of the most imperiled fisheries documented in the Oceana report, drift nets, longlines, and trawls were responsible for the greatest amount of by-catch. Many fisheries throw back more sea life than they retain for market, and a host of threatened animals become collateral damage in the quest for specific species. In the span between 2008 and 2012, California gillnet fisheries seriously injured or killed 39,000 common molas and 6,000 sharks. All told, they tossed away almost 63 percent of what they brought onto the boat. Shrimp trawlers, which gouge the bottom of the ocean to find their prey in the South Atlantic and Gulf of Mexico, were reported to have discarded 64 percent of their total catch. According to the National Marine Fisheries Service, up to 50,000 endangered sea turtles are killed every year by trawling. The practice further disrupts ecosystems by raking away fragile and ancient marine forests, destroying biodiversity, and leaving little but mud in its wake. The Oceana report notes that only one to five percent of US fishing expeditions are under any sort of observation, and that the industry has little incentive to comply without more intense regulation. The best available data still tends to be unreliable despite the best efforts by the NMFS, and Oceana urges more detailed work in order to estimate fish populations, set catch limits, protect sensitive species, and keep tabs on overall levels of by-catch. Concerned consumers can make better purchases by visiting sites such as the Monterey Bay Aquarium and downloading their Seafood Watch app. The guide offers the best choices for meals, recipes, and restaurants in their area that feature sustainably caught fish. Advocating for government regulation and the implementation of marine sanctuaries can also help reduce by-catch and heal areas depleted by unsound practices. A report by Oceana details the horrifying environmental cost of by-catch within US fisheries.